Cockerina, Cheryl, ALittle More Minis, Cindy, Bears House, Once we were Faeries Judy, C.M., Maria, Chrissey, Luana, Bridget, Dark Squirrel Victoria, Maryam, Beautiful Dees, Mary, Sabiha, Alison, Anna, Nati, Evarh, Barbara, Weelittle West, Oiseau de Nim, Ester y su Mundo, Norma, Looking Glass Miniatures, Fabiola, Jody, Ayamontinomaria, Unicornio,Puppenhausmary 33 Macrupe, Miniaturista, The Old Maid, Maryjanestearoom, Bonbon, Bois-Fleurie, Pepi, Catherine, Miniature Allsorts, Aracelis, Chabby Chic Shaz, Simply Chateau, Nina, Robins in the Trundle Bed, Carmen, Alicia Castro Masaveu, Taschen Paradies, Mary Williams, Sharon and Elis. Muchas gracias , es un placer ser seguidora de un blog tan maravilloso. 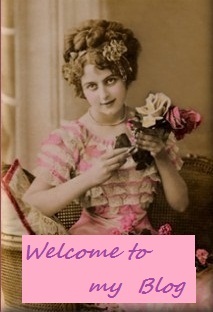 Glad to see all your new followers,your blog is so pretty I know we will all enjoy it. Grazie per dare un "benvenuto " così bello e speciale ai yuoi sostenitori, tu meriti molti complimenti per tuo blog bellissimo !